This year, haulage of semitrailers new services will be offered within Viking shuttle container train project. 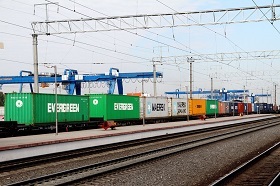 There are plans to purchase two full configurations of train cars for this purpose, according to Egidijus Lazauskas, director of the Freight Transportation Directorate of Lithuanian railway company Lietuvos Gelezinkeliai. Viking Train carried 37% more cargo in 2017 and handled 46,000 TEU containers, an increase by 37% from 2016. Viking Train is a joint railway project of Lithuania, Belarus, Ukraine, Moldova, Romania, Bulgaria, Georgia and Azerbaijan, which links the seaports of Klaipeda, Odessa and Chornomorsk.